Because of which I was hardly ever happy. I thought taking out all that rage would relieve me. Instead, it just escalated. As I grew older, I became angrier. The much I took it out, the much it consumed me. To top it all, I was blessed with a lot of physical strength (Alhamdulillah), but I used it in all the wrong ways. I won many fights. Physical and emotional. And I was very proud of them. Like I won. I thought I won, and I stayed in that little bubble of mine for a long, long time. Nothing changed till I chose to pop it when I felt that something was wrong – As I became aware of how my anger is destroying me. I’m 23 now, and it all makes sense. Everything is connected. I am stronger than before Alhamdulillah. Both physically and emotionally. And I feel sorry for all those fights I won. Also, the ones I didn’t win. I don’t take pride in them anymore. The worst moments of my life have been due to anger. And even though I don’t feel bad about the trouble I went through, I still feel sad about losing the part of love from the people I loved, just to learn these valuable lessons in life. But in one way, I’m glad. I’m glad I went through all those hard days. They changed me for good. I learned self-control. It couldn’t have been possible without Allaah’s help. This is the first step to redemption. Just ask from Allah. Ask Him for patience. Ask Him to grant you gratitude. Pray to Allah. Talk to Him. Go on a long drive alone and have an open-hearted conversation with Him about your frustrations. You wouldn’t hear anything back, but you would feel it. Allah can listen even if you don’t say a word from your mouth. All that anger and all that rage, won’t take you anywhere. Trust me! Allah’s mercy is endless. Everyone’s point of you will be changed. What’s making you angry now, will have a different face tomorrow. Throwing your anger away won’t happen in a matter of a day, neither will it just vanish. Maybe after days, perhaps after years…but just trust Allah and you’ll see how it changes you for good. You won’t wake up tomorrow, saying OMG! Where did all that rage go? That won’t happen. But you can wake up next day and decide to use it in a positive way. Just cling to hope. If someone slaps me and I manage to forgive him. Surely I won’t be that forgiving the next time around. By the third time, probably I would just want to shoot that person. And yet we, who can’t forgive people the third time around, expect Allah to forgive us every single time. It’s because He keeps on giving us the success and keeps on showering us with blessings. Then why not start forgiving people for the sake of Allah, to earn His pleasure and as a form of gratitude? You would love the feeling of letting go and feeling so light as a result. 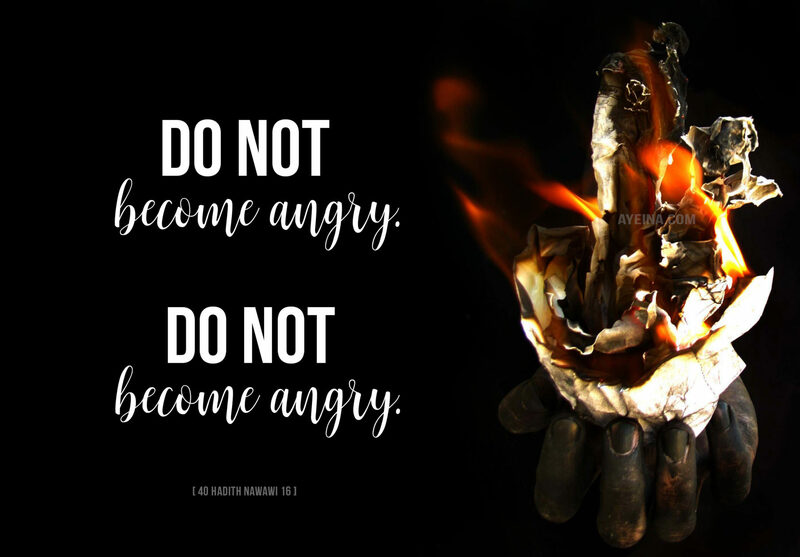 Anger will destroy us here and the hereafter both. We will fall. You might not trip from the same rock I do, but we both will fall. It’s a path that destroys a person after all. Just ask yourself, don’t you want peace of mind and soul? Part2: Controlling Parental Anger through Islam. Masha’Allah, what a beautiful post. Some amazing tips on how to calm down when angry. JazakAllah kahir for the tips. I used to be very angry…I still get angry quite quickly…but I am more of the kind of person where it builds up and then I erupt like a volcano….which isn’t really good either! Anger is such a destructive emotion whether it’s directed at the young ones at home or colleagues at work. I love all the tips from the sunnah. They are very effective. Masha Allah. It’s good to equip children with these tips from a young age. May Allah save us from the ugly side of anger.